The trade deadline has passed. Surprise! The Dolphins made no moves at the trade deadline, electing instead to go with the “salvage the season” approach. Like, it’s going to work this time, right? Well, after going 3-1 in September, the Dolphins went 1-3 in October and 1-2 in November. There is no way the Dolphins can win four of their next five games. The Bengals, Texans and Colts all hold the tiebreakers if it comes to that. It won’t. Sadly, I am at the point, if I wasn’t already, to look beyond this season. 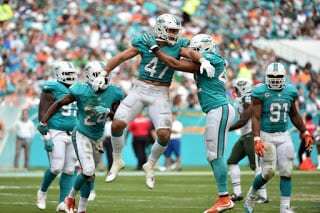 Crazy as it may seem, the offseason for the Miami Dolphins is my favorite time of year. Oh sure, there is the emotional high I get when the regular season does roll around, but really for those four months after free agency has begun, after the draft has occurred, after following all the storylines in training camp, I am left to wonder and hope that next year will be our year without actually knowing it and having to deal with it. There is comfort in that. See, Dolphin fans right now are being forced to deal with what we’ve had to deal with for the last 10+ years or so. We have to deal with the growing pains of a relatively new regime that we all know is not going to do better than 8-8 this year. Dolphin fans are obnoxiously opinionated about what to do once the 2018 concludes. It’s clear that after suffering the growing pains for so many years and not just with this regime, but prior to them, that it has taken its toll. This offseason is going to be most intriguing. I cannot wait. Mouth-watering to the point of tears intriguing. What is Ross going to do with this regime? Is he going to fall into old habits and start lopping off heads one by one starting with Tannenbaum’s? Or is he going to let this regime run its course? Maybe he will cut ties with everybody and start over? What about Burke? Will they let him go? And if so, who replaces him? What are they going to do about some of their players still under contracts like Tannehill’s and Jones’? Is this their final year in Miami? What about the draft? What’s going to happen in the draft? I can’t wait! It’s all too good! The road to December has been paved. Just got to get through this final month. Miracles can happen but it will take nothing short of a Christmas miracle for this team to the reach the playoffs this season. I’m not expecting it to happen. Let’s move on. 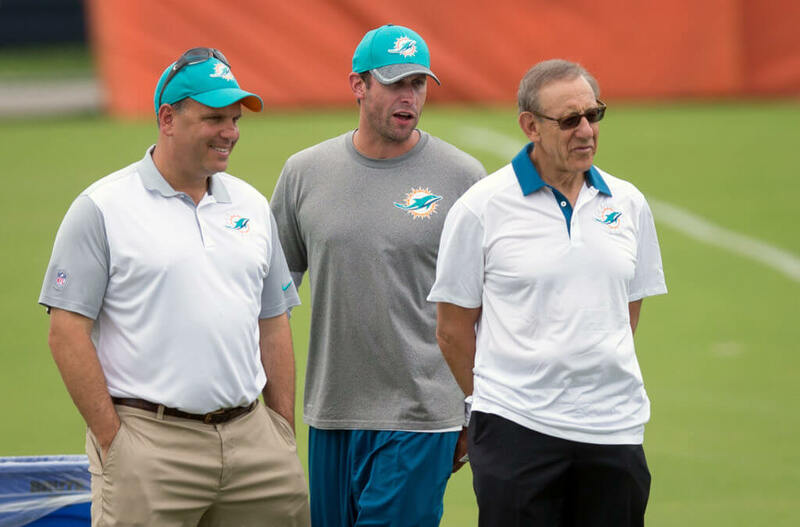 If Dolphins Owner Stephen Ross wants to take a second stab at Jim Harbaugh, I’m fine with it. I can live with losing the all-access pass to Nick Saban and waving bye to my Bama boys being drafted. But, you better be darn well sure you can get him. Because if you bring in more people who are just using the Miami Dolphins as a stepping stone in their career to bigger things, then 3 years from now, we are going to be saying the same things about those guys. What went wrong this time and that whole nonsense. I know it’s coming. Be careful when you buy into the hype with someone. I enjoyed the 2016 ride but I said from the beginning, Gase has to prove to me he can do it again. I was right to keep my emotions in check. Especially after what happened with Tony Sparano. If Ross feels he damaged that relationship with Harbaugh eight years ago and it’s beyond repair, then I would just stick with this current regime. 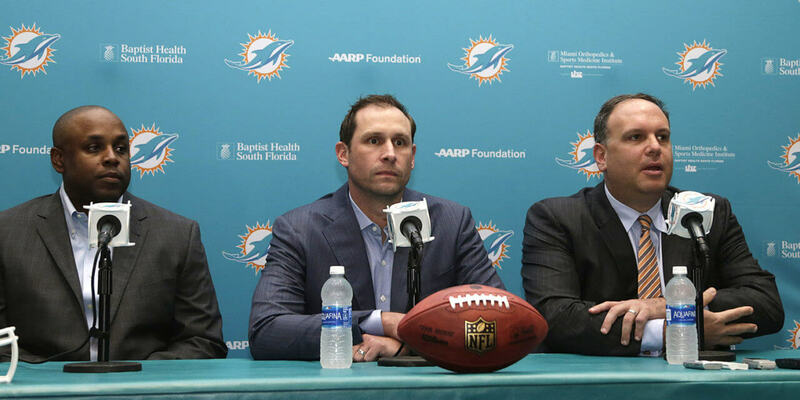 You’ve got a whole heck of a lot more to lose if you get rid of Tannenbaum, Grier and Gase now than you do if you keep them around just a little bit longer. I know Tannenbaum’s got a spending problem. I know Grier’s drafts started out average, but he is getting better. I know after three years, Gase’s playcalling is still the equivalent of a rookie head coach. Don’t buy into the hype! News flash, Dolphins Head Coach Adam Gase was the right guy. 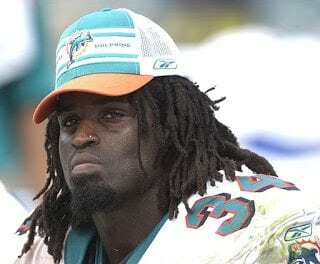 He had a lot of hype and a lot of job interviews scheduled after the Miami Dolphins, but we were his first choice. I don’t think people understand how lucky we were to have a situation like that happen to us. The Dolphins—and I hate to say it—are somewhat of a laughingstock right now. We are a coach’s last choice, not their first. This regime, flaws and all, has assembled a nice group of talent, certainly more than I have seen in a while. Why risk getting rid of them for something that may not be better? The reality is there are no quick fixes here and, as much as I want there to be, 2019 will probably be a rough year too. It doesn’t matter who you get. Ross could create a scouting department which has an objective to find free agents who can help the team. In any workplace you want work with people you know. I get that. But this regime might benefit from having an extra influence. I don’t hate Matt Burke. I just don’t think keeping him here is going to help the situation. This franchise is in a constant state of flux right now. There’s no established program. There’s no proven agenda. Tannenbaum, Grier, and Gase are just guys trying to muddle their way through all this and hope something sticks. This team is constantly rebuilding and I think having an experienced Defensive Coordinator would benefit Head Coach Adam Gase the most. I have mentioned Jack Del Rio in the past. I wouldn’t be disappointed with a Mike Nolan reunion. He is currently the Linebackers coach for the New Orleans Saints who are 10-1 right now, but he has had stints as a Defensive Coordinator with the Ravens, Broncos, Falcons and Dolphins during the Sparano era. He also served as Head Coach for the San Francisco 49ers from 2005-2008. Maybe, if this regime doesn’t work out, he is a potential head coaching candidate. Moving on to the salary cap situation. 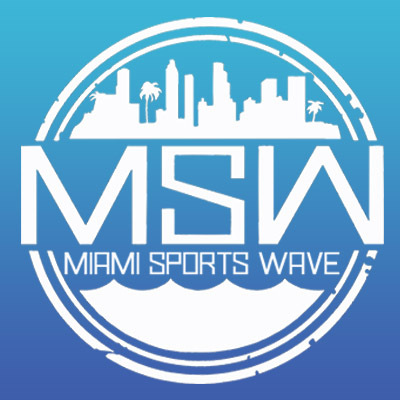 In 2019, the Dolphins have over $13 million in dead money they have to pay Suh. Tannehill is making $27 million next year and $25 million in 2020. Tannenbaum can’t afford to restructure Tannehill’s contract again. They could either cut him and have more dead money to deal with down the road or bite the bullet and pay him. Trading him is not an option. He can’t stay healthy. No team is going to sacrifice draft picks for an QB who hasn’t played a full season since 2015. As of now, I would do this: If Tannehill can get through these final 5 games with no further injuries, go ahead and bite the bullet and pay him the money next year and go from there. Reshad Jones’s contract is almost just as bad. He gets paid $17 million in 2019, $16 million in 2020, and $15 million in 2021. I see Jones as tradable. He’s a guy who I think can transform a defense for the right team. If you can’t get better than a 3rd rounder for him, take him off the market. There’s plenty of depth at Safety. Minkah Fitzpatrick is the future anyway. Maybe Maurice Smith, if he ever gets a chance, can help this team out also. Quinn’s contract ends in 2019. He is going to make $13 million. The only reason I say bite the bullet, and I am using that phrase a lot, is because we have nobody behind him. Jonathan Woodard? Charles Harris has been a bust. To be fair, Woodard did make my impact analysis and stepped in when Quinn got hurt for the Bears game. I applaud him for that. The fact is our two best pass-rushers are getting up there in age and Cam Wake is a free agent next year. Tannenbaum doesn’t need to restructure Quinn’s contract. He is not the same player he was three years ago. Stills is making $10 million in 2019 and $9 million in 2020. Truthfully, I don’t think he fits into Gase’s system anymore. 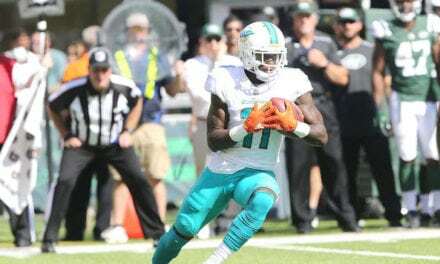 He is tied with Albert Wilson with four touchdowns and Wilson hasn’t played in a month. I think on the right team, he has value. I would try to trade him for a fourth round pick or better. Speaking of Wilson, his cap hit is little over $8 million in 2019. That’s not terrible. But in 2020, it jumps up to $11 million. It’s a shame he got hurt. I think without question, he is coming back in 2019. I don’t want to talk too much about the upcoming NFL Draft. We are still months away. In the past, I would have hated the Miami Dolphins taking a QB early in the draft. It’s a glamour pick. It’s a pick you make to sell tickets. It’s a pick you make after you have the defense, offensive line and running back positions figured out. This year, I have been so upset with how the quarterback position has been handled that not only am I saying get one quarterback early, get two! Let it be an open competition between, I’m assuming, Tannehill and Falk and the two rookies. May the best Quarterback win! We need pass-rushers in the worst way. The Harris and Branch experiment has failed. I like Hayes but he can’t stay healthy. Plus, he is on the wrong side of 30. So is Wake. Quinn isn’t far off. I do like what they have done at DT though. Wouldn’t hurt to have another LB and CB either. Offensive Linemen are always good to draft as well. As we all know, the draft is not based on needs. So, who knows what the roster will look like a year from now. Bottom line, who is going to be drafting it? I’m probably in the minority but I say everyone is coming back because I just don’t have faith in Ross to get anyone better at this point. You just hope with extended time that this regime will continue to learn and grow and overcome some of the mistakes they are making now. 98% of our problem on offense is; and has been for years is QUARTERBACK!!!!!!!!! No one wants to coach in Miami because they are told upfront that tannepuke is the QB. The coaches interviewed 3 years ago told the front office that the best QB on the team will start. Non of those coaches were invited back or hired by the dolphins. Adam Gase was hired because he said that he would make tannehill the undesputed QB no matter who competes against him. Then adam gase was hired. This explains why any QB who is clearly better than tannehill is released asap. Only QBs who are not better than him are kept on the team. All of the fans who have been watching tannehill since 2012 can see that he s and has been the problem from 2012 until now.